Frances Calderon de la Barca, born in Edinburgh, the daughter of William Inglis. After her father’s death she settled in America, where she married the Spanish diplomat, Don Angel Calderon de la Barca. She accompanied him on his various appointments to Mexico, Washington, and finally to Madrid, where she was created Marquesa de Calderon de la Barca by Alfonso XII. The present work is the result of observations made during a two years’ residence in Mexico, by a lady, whose position there made her intimately acquainted with its society, and opened to her the best sources of information in regard to whatever could interest an enlightened foreigner. It consists of letters written to the members of her own family, and, really, not intended originally–however incredible the assertion—for publication. . . .Suffice it to say, that the Mexican manana (to-morrow), if properly translated, means never. As to prices, I conclude we pay for being foreigners and diplomates, and will not believe in a first experience. However, we are settled at last, and find the air here much purer than in the heart of the city, while the maladies and epidemics so common there, are here almost unknown. Behind this house is a very small garden, bounded on one side by the great wall which encloses the orchard of the old monastery of San Fernando, within whose vast precincts only seven or eight monks now linger. It is an immense building, old and gray, and time-worn, with church adjoining, and spacious lands appertaining to it. At all times it is picturesque, but by moonlight or sunset it forms a most olden-time vision. While I enjoy this book, it's a little.... ongoing.... and I keep putting it down to go to other stuff. Someday I will finish. 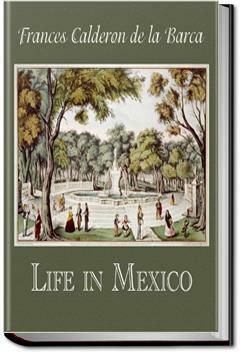 Provides a good overview of newly independent Mexico but is quite bland in parts. It is the journal of an Enlish woman married to a Spanish diplomat to Mexico---after the revolution around 1840. She writes beautiful and complete descriptions of everything and she is quite funny.